I have some friends that are in the coconut oil business. Before I knew them, I knew that coconut oil was good for you, but I had no idea of the vast differences when it comes to extracting the oil from the fruit itself. After all, coconut oil comes from real, live coconuts. You know, the coconuts that come from coconut trees! My friends share a coconut plantation with other coconut farmers in Thailand, where this particular coconut oil comes from. The trees have been on the plantation for a very long time, and just recently have been tested for organic certification. It turns out that there are eight (!!) different ways to extract coconut oil from the coconut. 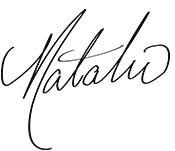 Some methods involve heat and chemicals, but it turns out that the most pure way to extract the oil is through centrifuge, where a wet-milling process is used to emulsify the product, and the resulting oils are extracted through centrifuge. This process uses no heat whatsoever, meaning that it remains a raw product, and thus retains all of its nutritionally beneficial enzymes and nutrients. Coconut oil is made of medium-chain fatty acids, which have been shown to have many health benefits. They are digested differently than other oils, and rather than being stored as a fat, it is converted into energy, that helps stimulate the thyroid function. It helps normalize blood sugar levels, and reduces adrenal and digestive work, giving your body more resources to restore itself. CoCoNana Coconut Oil is the best of the best, so I really wanted to keep it “raw” while also exploring other cooking techniques. 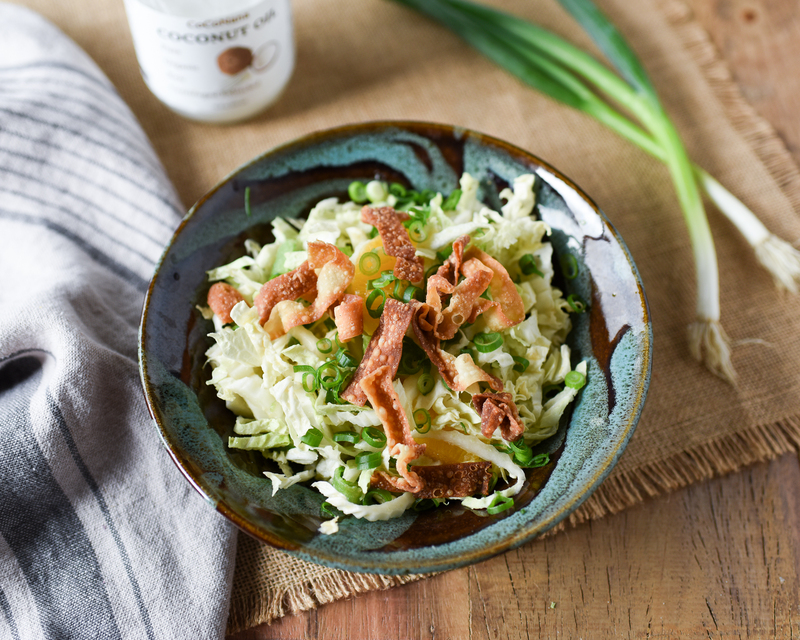 That’s why I kept it in its raw form for this Coconut Oil Dressing, but used it in a heating application as well with the fried wonton strips. I do believe it’s the perfect combination to explore this delightful oil in two very different forms, and it’s all delicious! If you’re interested in increasing your health benefits, and using this snow white, raw, pure oil, Nana Solutions is giving the first 50 signups to their newsletter, a 15% off coupon! So be sure to visit their site and sign up for their newsletter. This product is amazing, and I know you’re going to love it! They also plan to release other superfoods in the future, so keep your eye out for that. It’s not just coconut oil! Heat up the coconut oil, 6 seconds at time in the microwave until it's melted. It transforms to a liquid at 76 degrees Fahrenheit, so it won't take much. Mix miso paste, ginger, soy sauce, coconut vinegar, orange juice thoroughly in a small bowl. Then, whisk in the liquid coconut oil vigorously. Set aside. 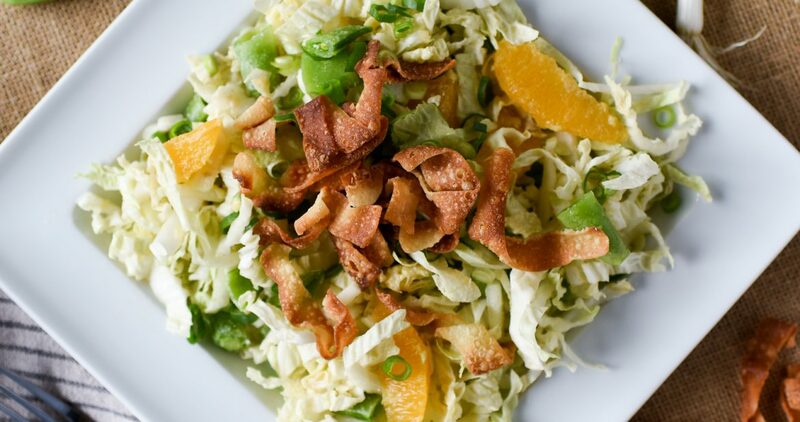 In a large bowl, mix thinly sliced Napa cabbage, sugar snap peas, and oranges. To supreme the oranges, remove the rind with a knife, and using a sharp paring knife, cut along the membrane walls, to remove a wedge of orange. Cut 12 wonton wrappers into roughly 1/4" strips, and separate. In a pan over high heat, add 1/4 cup Coconut Oil. When the oil is hot, add the wonton wrappers, and toss constantly so they don't burn and brown evenly. Once browned, remove to a paper towel and salt lightly. Divide the salad mixture among 4 bowls, and top with scallions and fried wonton wrappers. Enjoy! A group of bloggers participated in the CoCoNana Coconut Oil campaign also. Here are links to their spectacular recipes! 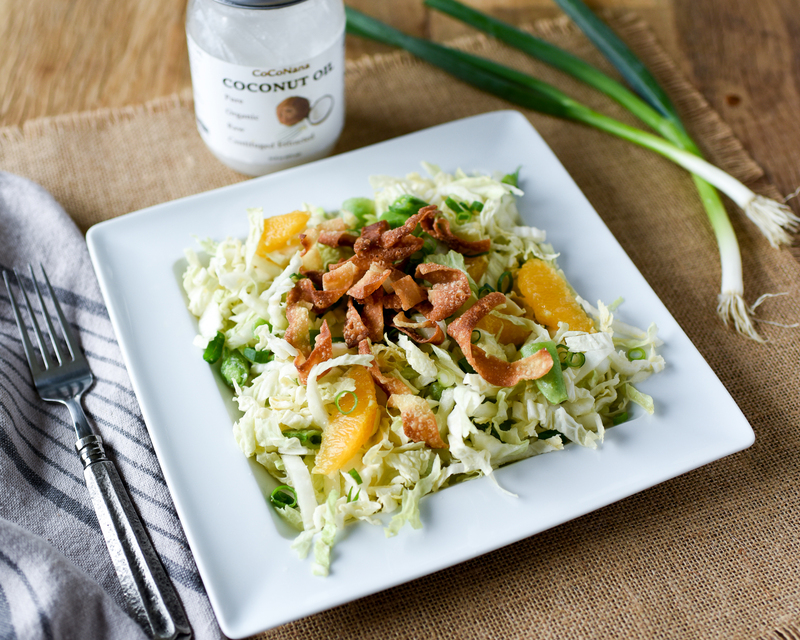 This salad looks fantastic – I love Napa Cabbage and the dressing sounds wonderful! What a great salad combination. The fact that is is beautiful and healthy are huge bonus points. LOVE your video and those salad hand utensils are a riot! 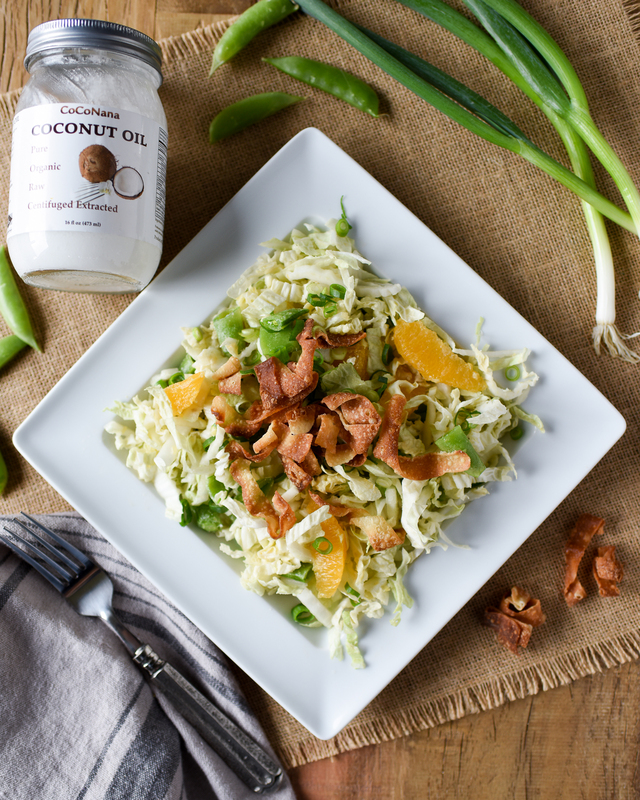 Love the coconut vinaigrette. What a great idea. Look forward to giving it a try!